1. The Gear 360 doesn’t work like the Ricoh Theta. 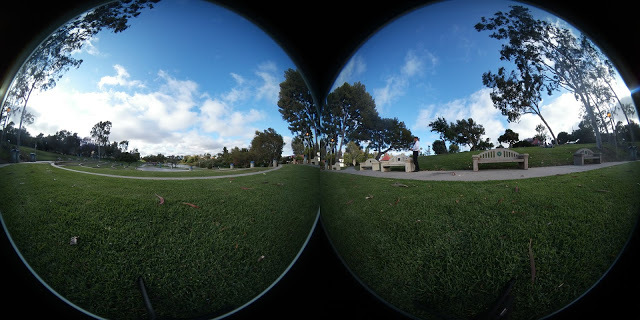 On the Ricoh Theta, Theta m15, and Theta S, you can download the photos directly from the camera to your computer and you’ll be able to view them properly. With videos on the m15 and Theta S, they need to be converted using Theta’s included software, but otherwise, it’s a hassle-free process. With the Gear 360, I found out it’s not quite so straightforward. Yes, it has a MicroSD card that in theory could make it easier to transfer files. In fact, I ordered a Micro SD card reader for an iPhone, thinking that it would enable me to copy files from the Gear 360 to my iPhone. In other words, it appears that unlike the Ricoh Theta or even the cheap X360 camera, the Gear 360 does not stitch the photos it captures. Hmmm. I’m beginning to wonder whether this is why Samsung made it compatible only with their latest flagship smartphones. It seems that the processor-intensive work of stitching the photos is passed on to the smartphone. 2. The software is picky. Well, at least the Gear 360 comes with desktop software for stitching the photos — Cyberlink’s Gear 360 ActionDirector, right? When I open files from the ActionDirector, the software begins stitching the file, whether it’s a photo or a video. However, on my laptop, I couldn’t get it to stitch photos. I would get a message saying I need OpenGL 2.1 or above. My laptop is about 4 yrs. old. It has an Intel i5-2450M processor with 8GB RAM and an Intel HD Graphics 3000 integrated video card. Fortunately or unfortunately, I upgraded to Windows 10. I’m able to use Hugin (which uses OpenGL) without any problems. But even after running Intel’s driver update tool, I could not stitch the photos. 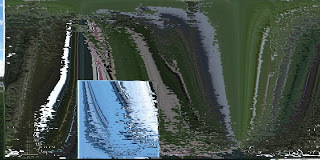 I thought that perhaps it could stitch the photo if I used the lower resolution 14-megapixel mode. Nope, couldn’t either. 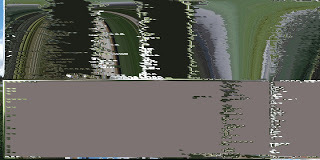 I thought, perhaps the file was corrupted. I tried another file. In fact, on this other laptop, I couldn’t stitch a video (I would get a garbled video). The specs of this other laptop are: Intel i5-2467M with 4GB RAM, with the same Intel HD Graphics 3000 integrated graphics card. So, it seems that unless I get a compatible Samsung phone, or upgrade my computer (maybe), or stitch each image manually, I will be limited to taking videos. 3. What about the image quality? 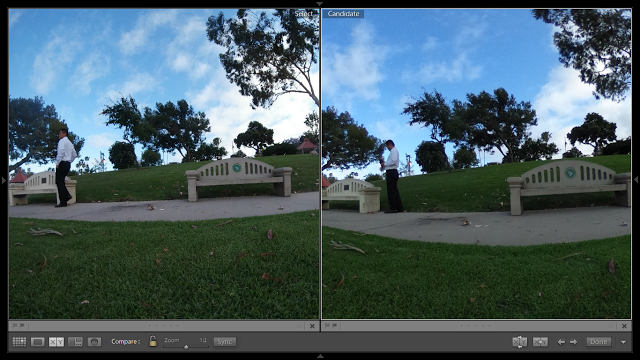 Although I could not stitch photos, I could do an indirect comparison between the double fisheye Gear 360 image and an equirectangular image with the Ricoh Theta S. In these pairs, the Gear 360 is on the left, while the Theta S is on the right. For this pair, I used different ratios so that they would have more similar viewing sizes. The Gear 360 is on the left (1:3 ratio) and the Theta is on the right (1:2 ratio). The Gear 360 looks a little sharper (for example, see the logo on the bench). 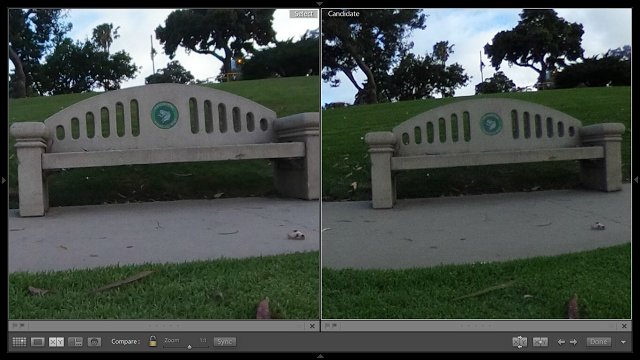 For dynamic range, they seem similar. Here is another pair, both 1:1. 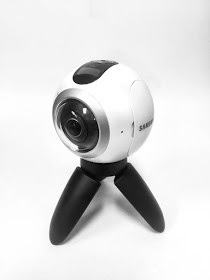 The Gear 360 looks more detailed. But here is a third pair, this one from the opposite side. On this side, the Theta seems to have slightly more detail, and better highlight details in the clouds. Here is a fourth pair, this time on the side of the cameras. With this pair, it almost seems that the Theta again looks a little better to me. For video, there’s no question the Gear 360 is in a totally different league from the Theta S. But I am interested primarily in photos. With these inconclusive results for photo (in this unscientific test), I think I would have to look at equirectangular images for both of them to get a more reliable comparison, which again points to getting a compatible Samsung phone. Arrgh! One area of concern is that on the camera’s controls, there is no true intervalometer. I want to take aerial 360 photos, and to do that, I need to have an interval shooting mode (so the camera can take continue to take photos even while far away from Wi-Fi range). 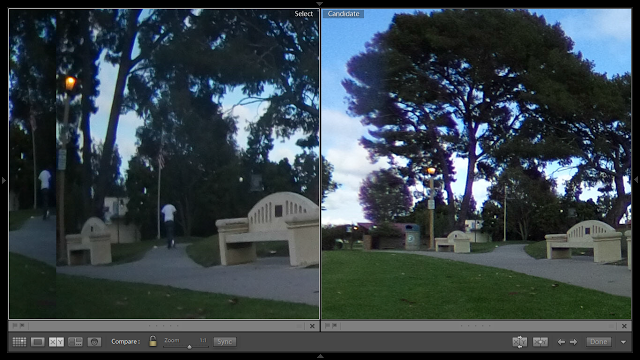 The time lapse combines the shots that it takes into a video, but doesn’t give you the individual shots as separate files (by comparison, the Theta S has a true intervalometer, and a separate utility for creating a time lapse from a series of photos). I’m going to try to find out if the app has an intervalometer. If not, that is a significant disadvantage for me. 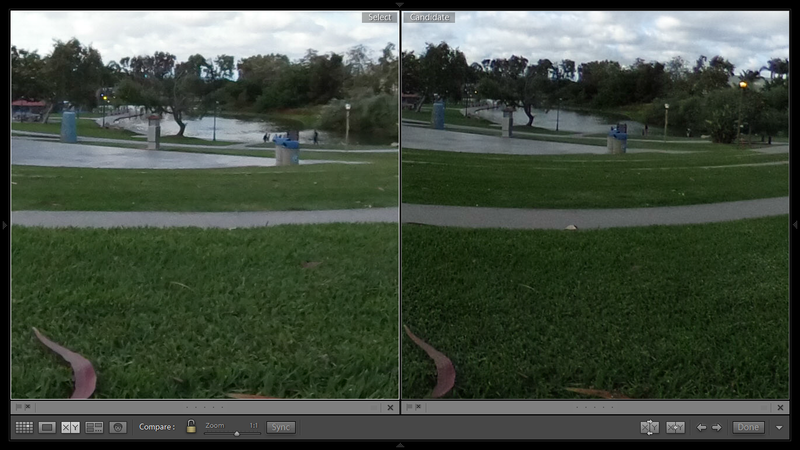 I plan to try to get access to a compatible phone to see whether the app has an intervalometer, and I’ll try to take a stitched shot for a more direct comparison with the Theta S.
After I installed the driver, I was able to stitch both photos and videos on my Windows 7 laptop. 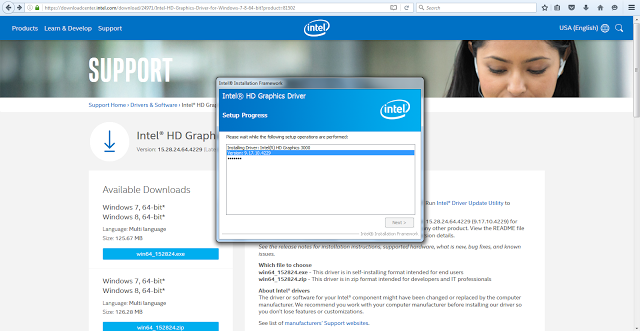 Note that there is so far no updated driver for the Intel HD Graphics 3000 on Windows 10 at this time. There is no intervalometer on the app. I am also trying to find the same thing. It should be possible to make a bluetooth app that can do this as long as the cam is paired. If you find something, I would love to know.